Note 1: Finally! :) Watch it on the big screen. Please. Note 2: I write this post for princess! Black Swan. I can talk about this extra-ordinary piece of cinema on so many different levels. Let me begin with my agonizing wait, anticipation, excitement, temptation to watch it on the small screen, some more agonizing wait, and finally, it hitting Indian theaters in March, after it had been going on around the world for almost 6 months. Was the wait to watch this movie in its full glory and magnificence on a larger-than-life silver screen worth it? Hell yeah! Nina: I just want to be perfect. Requiem for a Dream was about obsession. 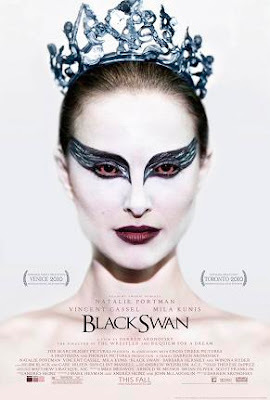 Black Swan is about obsession for perfection. We have all experienced it at some level, in some form or other. And have felt it destroying us, slowly, from inside. And this destruction is not destructive, its an exploration, of you. You cannot stop it, you eventually let go, and maybe achieve (perfection), but at what price? Perhaps, the pursuit of perfection is meant to persist, and people, persistent. Perhaps. The hand-held camera work gives an ethereal quality to the footage. The scenes are picturised perfectly. The use of mirrors is overwhelming. The climax, when Nina is dominated by her dark side, and she transformed into a (black) swan is absolutely brilliant! Thomas Leroy: Perfection is not just about control. It's also about letting go. Surprise yourself, so you can surprise the audience. The only person standing in your way is you. You could be brilliant, but you're a coward. Natalie shines playing Nina's quest for perfection as a ballerina. To be truly complete. The frustration, in being the perfect white swan, but a frigid and stiff black swan. Thomas Leroy: We all know the story. Virginal girl, pure and sweet, trapped in the body of a swan. She desires freedom but only true love can break the spell. Her wish is nearly granted in the form of a prince, but before he can declare his love, her lustful twin, the black swan, tricks and seduces him. Devastated the white swan leaps of a cliff killing herself and, in death, finds freedom. The Perseverance. To let go. The Greed. To be perfect. The Envy. Of another flawless black swan in front of her eyes. The Wrath. Of failing. The Lust. Of the enemy. The Sloth. In her performance. and The Pride. Of perfection.